I wanted to see if I could build an 8x6 color grid using only CSS colors. Upload a font and get a bitmap image of your font. Hiding a dropdown menu behind an icon. Tiny, language-unspecific, syntax highlighting, based on microlight. Using a scrollbar to make a slider input. How many times was the Scratch surprise licked clicked? If you are reading this, my website is working! Color grid with only CSS colors? It took some time, but I got it done. See it here! It was tricky. The hardest colors to decide were probably light blue, purple and pink. The ones that came at the best were probably yellow and dark blue. Feel free to use this layout of colors if you give credit. Sorry I havn’t posted in a while. I’ve got a lot to write about. I now have search on my site! Yay! One bad thing about Github Pages is that it is hard to create forms on it. So I decided to create a Weebly site to host all of my forms, because forms are so easy there. The site is here. You can also request to have a form create for you. Because of this, I will resume poll of the month! Poll of the month was later added on 6/11/2017, joined by quiz of the month on 6/14/2017, which ended on 9/2/2017. I’m getting rid of poll of the month for now, because nobody would respond to the poll. If five people comment “I want poll of the month back”, I will bring it back. The question this month is: How many of the things you like are you good at? In my last post, I said that polls would resume! Well they have! Fill it out here. Results will be on this blog. What is your favorite out of the following games? Lag out the browser console! Ever wanted to lag out the browser console? Well now you can! This code makes the console glitch out. If you try scrolling, some parts of the console will disappear. You may even need your task manager to close the tab!!! Sorry about the image quality. 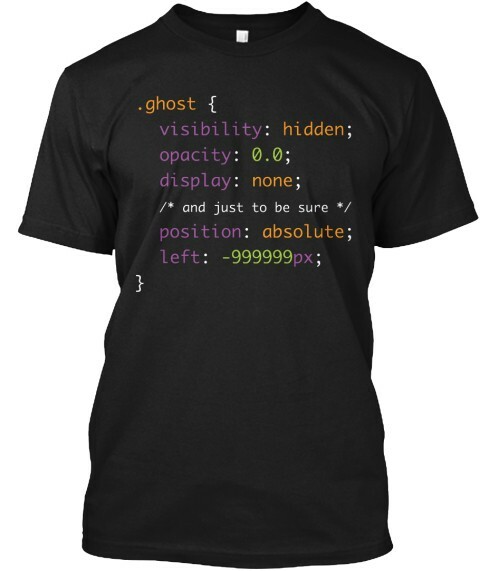 You can make your own with a shirt, fabric paint and some CSS knowledge! As you may know, Scratch 3.0 came out on Wednesday! Yay! Or not. I’ve never actually met someone who really loves Scratch 3.0. I was excited for it, but it could really use some more work. 1. Fix the loading bugs now!! I’ve seen several Scratchers whose projects don’t load the blocks! In two videos, someone reported they’ve been working on a project for months, and now they can’t work on it because there are no blocks! The project runs fine, but they can’t edit it! This is crazy. 2. The blocks are WAY TOO BIG!! I know they want it to be more mobile friendly, but I tried Scratch out on my iPad Pro this morning, and IT WAS TERRIBLE!! Whenever I tried to move a point in the vector editor, it thought I wanted to make a new point. I got so frustrated, I threw the iPad down, and switched to the desktop. Point is, the Scratch editor will never be good on mobile. At the very least, please make there be an option to shrink the blocks. This isn’t a big problem for me, but I know a lot of other Scratchers who are extremely mad about this. I’m afraid Scratch will remove a lot of good users by making this change. It’s really not that hard to change back (just make a userscript and change the flex order to 2 on the block editor), but not everyone knows that. Scratch 3.0, maybe it should be called Snail 3.0. It’s really slow. In this video, the account nav takes so long to load, the user thinks their account is gone. And in several projects (I had one, but I lost the link), Scratch 3.0 slows it down enough to be unusable, even in turbo mode. This isn’t that big of a topic in the community, but this is my personal opinion. In Scratch 3.0, the events category is #ffd500, a yellow-orange color, and the control category is #ffab19 a weird orange-brown thing. In Scratch 2.0, events is #ca8135, a brown color, and control is #e4a826, a yellow. Point is, they flipped the colors! This is so confusing! I am not a big fan, everything is hidden in all these folders and I can’t find one of my favorite side views of a penguin 🐧. I do not like scratch 3.0, It has so many new features that are hard to get used to and next time use the same concept as 2.0 but just has more easily controllable features. As you can see, only @77757775 even sort-of-likes Scratch 3.0. Scratch 3.0 started as a good idea. And some parts are still good, like the new extensions, the new art and sound effects, not needing Adobe Crash Player and mobile support. But there are still some serious problems. I know the Scratch Team was rushing to finish, because they postponed it for over a year. But since Flash isn’t gone until 2020, they still have another year before they absolutely have to release it. I think they should have taken advantage of that. Oh, and try out my new userscript to fix some of these problems. The new progressive web app ideas that browser developers have are pretty cool. But I think there are a few APIs that the web would be way cooler with. This API would let developers modify the list of spellcheck words on that website. These change would be on that website ONLY, unless the user accepted a permission that lets the website change the whole list. You could use this API to take screenshots and screencasts of a webpage. This would work like the camera API. Although we have the eval() function, it is know to be insecure and “eval can be evil”. This new API would let you provide a new context to replace the window context, and could only connect with the host page using window.postMessage(). data; // Returns "hello world"
script.run("hello world");// Returns "Dogs say woof"
That’s all for now. I’ll post more if I have more ideas. Node.js and NPM for the absolute beginner. Finally, go to localhost:8080 and try out the different paths. Play around with this file and try to make a really cool website. NPM, or Node Package Manager is a website that lets you view, reuse, and publish Node.js code. Each set of code is called a package, and can be fetched with the require command, like in the previous example. To install a new package to your computer, navigate to the folder, type npm install packageName and press enter. If you type npm install without a package name, this will update all packages. Packages can be found on the npm website. I’m definitly not a Node.js expert, I just created this so you don’t have to make the mistake I made. If you have any questions, comment below, but don’t expect me to know the answer. Today, I was trying to figure out how old a web file was, I used document.lastModified, and I was surprised to see that the date was today, a few seconds ago. That info didn’t seem right, so I reloaded the page. This time, the date was different, now even more recent! I think this was because the file was returned by a server scripting language, which “created” the file a few seconds ago, even though the file was really older. So beware of using document.lastModified; it might be wrong. Next, replace all instances of yourusername with your Github username. By default, comments must be closed to have them displayed. To disable that, on line 7, change ?state=closed to ?state=all. By default, others can reply to others posts. Replies do not use moderation. To disable replying, remove line 16. This is now what you see when you visit http://goo.gl . What happened? It turns out Google no longer wants people to use their URL shortener, goo.gl. Somehow, this is a way to promote Firebase Dynamic Links. How does that work? They are telling new customers to go to bit.ly or ow.ly. If you need a new shortener, I reccomend reading this post, but my personal favorite is http://is.gd . By the way, Firebase Dynamic Links look a bit cool if you plan on building a mobile app. These are great partner URL shorteners. They have very short URLs (only 4-5 character domain names), and they enable custom URLs, like https://is.gd/google. They both agree to never use third-party advertisements, and they both have simple APIs that don’t require authentication. The only downside is that with v.gd (but not is.gd), a warning is display before visiting URLs. I also discovered this cool feature today: If you visit https://is.gd/google, you are redirected to https://google.com/#hi. This great for single-page web apps, so you can shorten hash links! This is a simple URL shortener. It allows custom URLs and has detailed realtime statistics. They promise that links will never expire, and there is code that prevents hard-to-read URLs (Is https://bit.do/0I https://bit.do/Ol or https://bit.do/0I). Although you need an account to use, tickurl.com has lots of free features! You can target your URLs to different locations, password-protect your URLs, and create a custom alias (whatever that is). It has more analytics than most shorteners, including the country the user was in. It is a new shortener, with only 269 URLs shortened (at the time of writing). This is a another simple URL shortener. Although it has paid plans, no account or price is required to shorten URLs. They promise no advertisements. Although it doesn’t have as many free features as is.gd or v.gd, it is helpful if you want a URL shortener that does what URL shorteners are meant too.